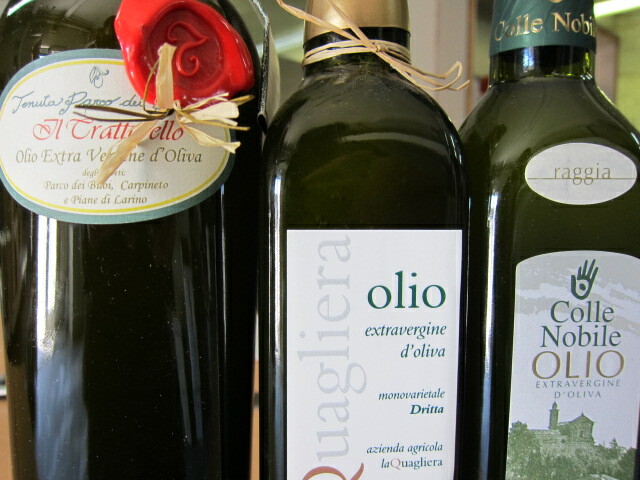 Gustiamo's Olive Oils Receive the First 3 Foglie by Gambero Rosso!!! Verona will host Vinitaly and SOL (Extra Virgin Olive Oil) trade shows from April 7th to the 11th. If you see fewer people around, it is because everybody is in Italy, these days. What’s new this year? Gambero Rosso, famous for publishing the “Guida ai Vini d’Italia” where the wines are star rated with “bicchieri” (glasses), the “3 bicchieri” being the highest, this year will publish its FIRST “Guida agli Oli d’Italia” where the stars are “foglie” (leaves) and the “3 foglie” is the maximum. – Il Tratturello, made by Francesco Travaglini in Molise. Particular mention goes to Francesco Travaglini’s Il Tratturello, since this is the ONLY EV Olive Oil with “3 foglie” from the Molise region. Bravissimi Tutti!!! If you are in Verona, go see Francesco, Giorgio and Prisca and give them a big 5 from us. If you are in America, you can buy their olive oils, here!!! Next Post Piennolo Tomatoes, A Sure Winner!!! Vi aspetto per un tasting at MIPAF stand and UNAPROL stand!! Congratulations!! But I love your other olive oils as well, for example the Piano Grillo is my favourite! Just because it didn’t get mentioned (or recognized by the jury) doesn’t mean it is a less great oil. Congratulations also to Francesco Travaglini! His Tratturello is outstanding, just today I have used it again to grace a dish. I have seen the special offer in the newsletter and on facebook, but I don’t see it here. Already over? Sold out? No! Hopefully not! I still need my share of these fantastic oils, and my order is on its way! Thank you, Tracy! It’s hard to pick a favorite among so many great oils. The promotion lasts only until Sunday or until supply lasts (we are almost out of La Quagliera olive oil). So hurry up!